CBT is one of the most researched therapeutic modalities out there. I first learned but CBT or Cognitive Behavior Therapy, when I was in school getting my Bachelor’s degree in Psychology at Central Michigan University. I was instantly intrigued by the idea that our thoughts were not only changeable, but that they can influence our unhealthy behaviors – even on a subconscious level. CBT is a type of therapy that seeks to change a person’s thought and belief patterns that might be negatively influencing their behaviors. It’s based on the cognitive model that says that dysfunctional thinking (that ultimately influences our mood and behavior) is common to all psychological distress and that when we learn to evaluate our thinking in a more realistic and adaptive way, we can improve our emotional states and behavior. If we don’t address these maladative thinking patterns, we end up in a cycle of negative mood states and perpetuating unhealthy behavior patterns. Perhaps you’ve noticed certain unhelpful thoughts come up, which can lead to a downward spiral of uncomfortable moods, depression and feelings of frustration with how to better your situation. It’s true that negative mood states are a part of life. However, if we can learn to become better at influencing our moods and behavior in a positive way by eliminating unhelpful or irrational thought patterns, we can greatly reduce our overall unhappiness while also becoming more prone to focusing on the good in our lives. When we utilize the principles of CBT in our disease management routine, it can be entirely possible to shift our mindset and influence our disease progression in a positive way. Keep reading to learn how CBT can be helpful for chronic illness. What Could Happen If I Don’t address unhelpful or negative thoughts & beliefs? The biggest downside of not addressing unhelpful thoughts is that you may struggle emotionally and physically to deal with everything life throws at you and the overall status of your illness can suffer. These thoughts took me down a spiral of anxiety and depression every time I encountered a symptoms, an increase in pain, a fatigue attack and so on.. and it made my symptoms worse, which led to me feeling more and more helpless in what I could do for myself. When it comes to chronic illness, I have found, that most of us can look at our thoughts and see where they could be influencing our feelings in a negative way, in turn creating a ‘happy place’ for it to thrive and flourish. So how can CBT help us improve our disease management skills? What will Cognitive behavior therapy do for me? Although chronic illness brings with it many challenges, including increased risk for depression and anxiety, we have the potential to make this experience easier to manage. When we choose to implement CBT principles, we can prevent episodes of depression and anxiety and ultimately have more control over our disease management process. We do this, through becoming objective observers of our thoughts, feelings and behaviors. This offers us the opportunity to make changes where we need to in order to improve our overall health and well being. The first thing I did to get better at observing my internal states was to practice mindfulness. This encourages us to take breaks throughout the day to observe our internal dialogue and emotions as well as to become more engaged with our moment to moment experiences. Over time, I learned that managing a chronic illness can be stressful, overwhelming and scary, but it doesn’t have to be. As part of your disease management plan, you can work toward correcting unhelpful thoughts, feelings and behaviors and implement new, healthier coping responses. 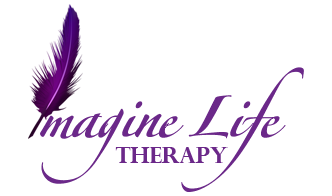 At Imagine Life Therapy, I help clients work through all their unhelpful thought patterns, learn to become curious observers of their internal states, without judgement, so they can be happier and healthier. CBT requires a solid alliance between you and your therapist for important work to happen. This means your therapist should show warmth, empathy, caring and competence while listening closely and carefully to ensure you feel understood. CBT encourages looking at problems through behavioral terms and setting goals for change that you and your therapist both share an accurate understanding of from your perspective. regardless of the diagnosis or problem, therapy sessions are structured to increase effectiveness. This usually includes an opening routine, like a mood check in, a review of your week and setting an agenda, a middle part, including homework review and discussing problems on the agenda and a closing routine, giving feedback to the therapist about how things are going. This also increases your practice of this process so you can do self-therapy when you terminate the therapy process. CBT sessions typically involve education about any psychological disorders you may be challenged with, processes at play when you experience certain symptoms and how the cognitive model can help you understand all of these things happening in your life and how you are responding to them. It also focuses on teaching skills to allow you to be your own therapist as well as in the drivers seat about the therapy process.